There was no time for pleasantries when Malcolm Turnbull and Labor candidate Justine Keay met at the same primary school polling booth in the knife-edge Tasmanian seat of Braddon. 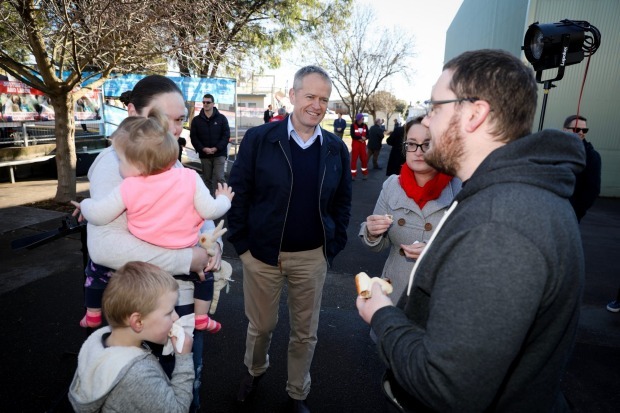 Early Saturday morning voters at Nixon St School in Devonport were unexpectedly confronted by the prime minister, Bill Shorten and both candidates. The government hopes to regain the seat in the state’s northwest – one it lost to Ms Keay at the 2016 election. The latest polling has Labor narrowly ahead 51-49 but the result could come to preferences from minor parties. 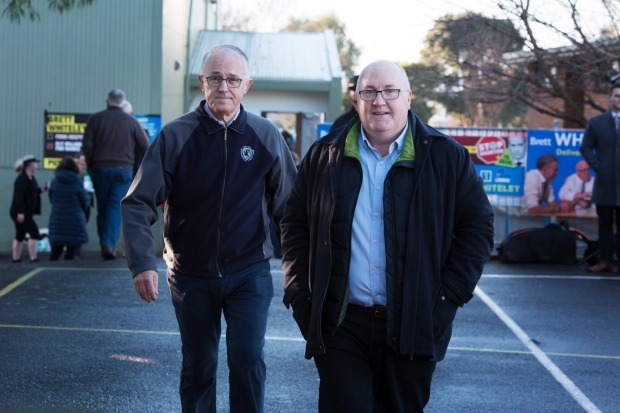 Mr Turnbull briefly appeared alongside Liberal candidate Brett Whiteley before the pair left for nearby Ulverstone. “It was nice of him to turn up,” Ms Keay said, criticising Mr Turnbull for coming in for “fleeting visits” when it suited. Ms Keay, who was forced to step down in May when it was revealed she had not renounced her British citizenship, shared a ‘democracy sausage’ with Mr Shorten. She cast her vote in her home town, something Liberal hopeful Mr Whiteley can’t do as he lives outside the electorate. Speaking alongside the prime minister in Ulverstone, Mr Whiteley said only he can deliver from government. “What’s best for Braddon? Best to have Brett Whiteley in the House of Representatives, a loud, strong voice in the party room of the Coalition,” he said. Braddon is one of five byelections being held across the country today, mostly sparked by dual-citizenship resignations. The Liberals have campaigned heavily on job growth, while Labor wants to fix a health system they say is ailing. Mr Turnbull declared Labor should be “miles ahead” in the polls, and was struggling because of their dishonest campaigning on health funding. “What that tells you is that many … are disgusted and appalled by Labor’s lies. They really are,” he said. Ms Keay, whose campaign has been bolstered by a steady stream of senior Labor politicians, said Labor was in touch with the needs of Tasmanians. Preferences from independent and outspoken fisherman Craig Garland and the Greens to Labor may get them across the line. Polling booths will close at 6pm when the focus turns to counting. A victory would be historic for the Liberals – a government hasn’t won an opposition seat at a by-election for 98 years. Close races in Braddon, along with Longman in Queensland, are being billed as a test of Mr Turnbull’s and Mr Shorten’s leadership.